Definition - What does Lunge Pose mean? Lunge pose is a beginner asana that stretches, strengthens and tones the lower body. 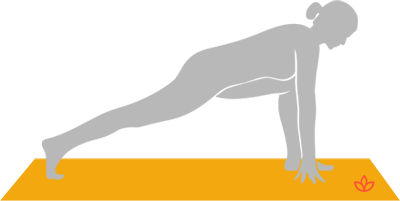 Begin in tadasana. Choose one leg and take a step toward the front end of the mat, bending the leg deeply so that the knee is at a 90-degree angle. Leaning forward, place the hands on either side of the front foot, shoulder-width apart. The front knee is directly above the front ankle. The back leg is straight, with the toes firmly grounded into the floor and the heel raised off the mat. Open the chest while keeping the hips even and shoulders relaxed. Repeat the pose on the opposite side. Lunge pose builds strength, flexibility and balance. It opens the chest, relieves low back pain and can help with sciatica by releasing tension in the hips and groin. If stability is a challenge, or if the yogi does not yet have enough strength to keep the back leg straight, the back knee can bend and lower to the floor. A yoga mat or blanket may be placed under the lowered knee so as to avoid compressing the knee cap unnecessarily. Additional ways to entering the pose include standing forward bend or downward-facing dog pose.